Dubai: Emirates reported a 351 per cent jump in net profits on Monday, with Dh3.4 billion ($925 million) for the first six months of its current financial year, ending September 30, 2010, compared to Dh752 million ($205 million) for the same period in 2009. The airline's revenue, including other operating income, grew by 35.5 per cent to Dh26.4 billion ($7.2 billion) compared to revenue of Dh19.5 billion ($5.3 billion), for the same period last year. Fuel continues to be the most significant expense for the airline, with operating costs up 22.6 per cent to Dh23 billion ($6.3 billion). The company, which has 201 aircraft on order, worth Dh249.76 billion ($68 billion) contributes an impressive 25 per cent to Dubai's economy. 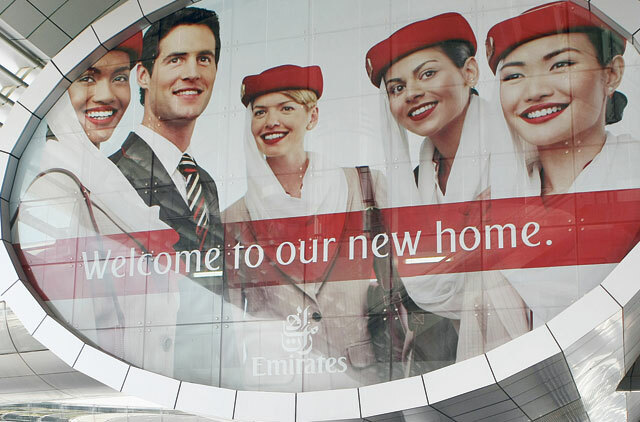 "Emirates achieved the growth by carrying 15.5 million passengers and recording a strong passenger seat factor at 81.2 per cent, the highest ever for a first six month reporting period. Premium class seat factors have also risen by 2.6 percentage points, reflecting an encouraging change in the global economic outlook," the airline said in a statement. Emirates' cash balances grew to Dh12.5 billion ($3.4 billion) by the end of September, which was a significant improvement of 18.5 per cent or Dh1.9 billion ($529 million) when compared to 31st March 2010. This increase in the cash balance was achieved after settling capital outflows of Dh2.4 billion ($8.81billion) primarily for pre-delivered aircraft. During the first half of the year, the airline also successfully raised financing of Dh4.6 billion ($1.3 billion). "The results for the first half of the 2010-11 financial year are incredibly robust, and reflect Emirates' success in growing customer demand, supported by investment in new aircraft, products and customer service. We continue to invest our profits in growing the business and our healthy financial position enables us to successfully meet all of our financial commitments and raise financing for future aircraft deliveries. Our strong position today is reflective of our ability to adapt, returning us to a vigorous period of growth. 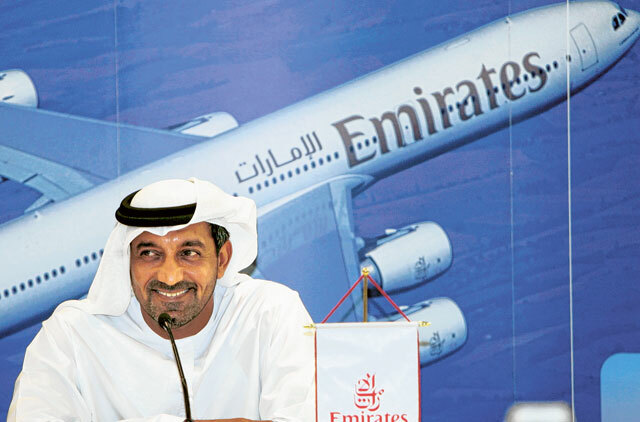 With 62 new state-of-the-art aircraft ordered in the first half, we remain well positioned to capitalise on this growth," said Shaikh Ahmad Bin Saeed Al Maktoum, Chairman and Chief Executive, Emirates Airline and Group. Emirates SkyCargo has also seen a strong half year performance across the network, posting an increase in revenue of 48.4 per cent to Dh4.4 billion ($16.16 billion), with cargo weight up by 23.7 per cent to 897 thousand tonnes, compared with 725 thousand tonnes for the same period last year. SkyCargo continues to post steady revenue growth, contributing around 17.8 per cent of the airline's transport revenue. "Investing in the future and adapting our operations when required is an integral part of our corporate strategy. This flexibility affords us the option of increasing passenger and cargo services on high demand sectors. By following these positive spikes in regional economies we have been able to maximise the use of our fleet to further stimulate revenue," added Shaikh Ahmad. 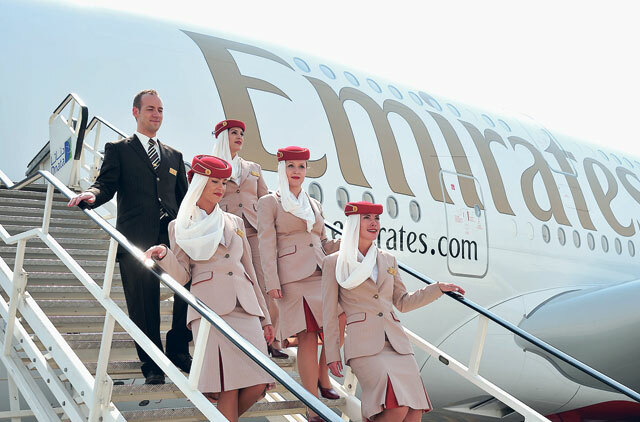 Emirates has launched six new destinations since April this year - Amsterdam, Prague, Madrid and Dakar (passenger operations), in addition to Almaty and Bagram (freighter only operations). Existing markets have also been given a boost with increased frequencies and capacity through larger aircraft. 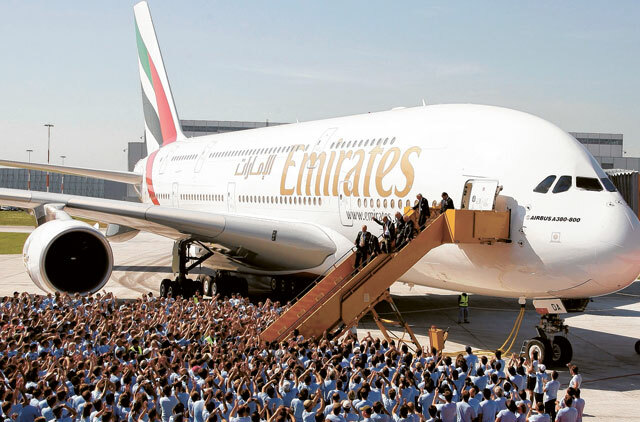 Building on its current A380 network, Emirates has launched two new A380 destinations, Manchester and Beijing. The A380 has become the airline's flagship. The company is also awaiting the delivery of six new wide-body aircraft, five Airbus A380s and one Boeing 777, and the opening of a new dedicated lounge at Shanghai Pudong International Airport. A further two new aircraft are scheduled to be delivered before the end of March 2011. Capacity measured in Available Seat Kilometres (ASKM), grew by 13.9 per cent, whilst passenger traffic carried measured in Revenue Passenger Kilometres (RPKM) was up 19.4 per cent. How would you rate air travel in the UAE? Which is you favourite airline?